When you shop at Amazon Smile , Amazon donates to DCHA. The Delaware County Historical Association was founded in 1945 to preserve and present the rich history of Delaware County. In the early 1960s, the Association purchased property, originally settled by Gideon Frisbee. Today, DCHA has over 600 members and presents the history and folklife of this county through the site's historic buildings, exhibits, programs and publications. Explore the rich history of rural America at the Delaware County Historical Association. 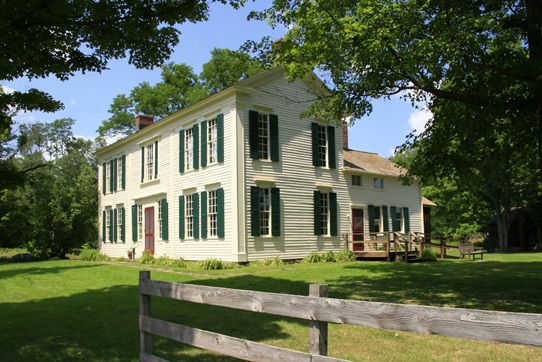 Visit the 1797 federal-style Frisbee House (pictured above, photo by Barbara Onasch) where eighteenth-century politicians met to form Delaware County. Located on the site of the historic Frisbee farm you can see the original barns, Frisbee family cemetery and outbuildings, as well as numerous nineteenth-century buildings from throughout the county that have been moved to the site, including: blacksmith shop, one-room school house, nineteenth-century gun shop, and turnpike tollgate house, a well as two exhibit galleries, research library and archives, gift/book shop, nature trail and much more. 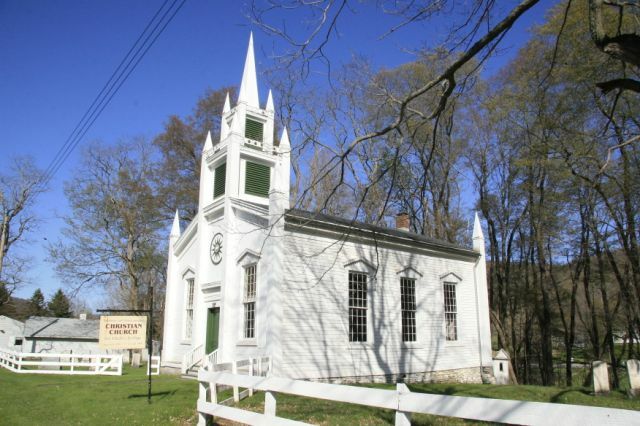 Just down the road is the Christian Church at Fitch's Bridge (pictured below, photo by Barbara Onasch). DCHA's Church and spacious exhibit space are both available to rent for private functions. Please contact us at (607)746-3849 or dcha@delhi.net for more details. Special programs provide opportunities for entertainment and enrichment for young and old alike. The "Produce, Preserve and Play" school program fills the grounds with young people learning about history through hands-on activities. Concerts and plays can be seen at the Christian Church at Fitch's Bridge, opened to the public in the Summer of 2001. Numerous workshops are held on site throughout the year. See our Calendar for a full list of upcoming events. DCHA is a private, non-profit organization that collects, preserves and presents the history and traditions of Delaware County and the surrounding region. DCHA serves a variety of audiences through the restoration of historic structures; the collection, care and exhibition of historic objects and archival materials; the documentation of living traditions, folk arts, social history and vernacular architecture; and the production of exhibits, publications and programs. Tuesday & Wednesday, 10am to 3pm, year round. A $5.00 donation is requested from non-Delaware County residents to help maintain library services. Tuesday - Sunday, 11am to 4pm from Memorial Day Weekend thru Columbus Day Weekend. DCHA is located on State Hyw 10, 2 1/2 miles northeast of Delhi. Our address is 46549 State Highway 10, Delhi, NY 13753. Delaware County's history has been shaped to a large degree by its geography and the perseverance of the people who have settled and stewarded the county's upland terrain. Many early settlers farmed the rocky hillsides and narrow valley bottoms, others sought the raw materials in the forests. Before the mid-eighteenth century Mohawk tribes of the Iroquois Confederation called the region around the two branches of the Delaware River home. Beginning in the 1740's, however, Europeans began to move into the area from the east and northeast, traveling overland through the Catskill Mountains, or utilizing the region's many waterways. For the most part, these new arrivals constructed rude log cabins in clearings hewn into the forests and occupied themselves with hunting and trapping. Gideon Frisbee (b. 1758 - d. 1828) settled in what was to become Delaware County around the year 1788. Typical of early pioneers to the region, he came to the Delaware River valley from Connecticut (Branford), via New Canaan, (Columbia County) NY. Gideon was the first son of Philip Frisbie, a fifth generation descendant of Congregationalist Puritans who settled in the New World during the early seventeenth century. Gideon, his parents and siblings, moved from Connecticut to New Canaan in the mid-1760.